The Navajo Nation Zoo and Botanical Park is the only Native American Zoo in the U.S. We are a Navajo Nation Government Program within the Department of Fish and Wildlife, and have six very dedicated full-time staff. Our Mission Statement is available for your viewing. The Zoo has been in existence since 1977, and you can read about our History and the history of the Zoo Logos. 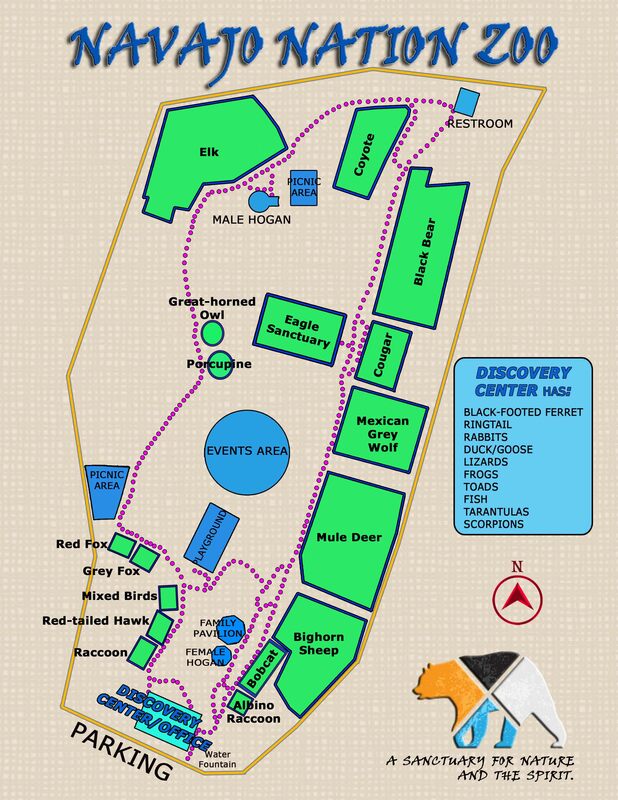 The Navajo Zoo has over 100 animals of 50 different species. Nearly all of our resident animals are NATIVE to the Navajo Nation. And most of our animals were found injured or orphaned on the Navajo Nation. Since these animals are unable to live in the wild, they are housed here and provided daily professional care. The Navajo Zoo provides an excellent opportunity for visitors to learn about, and make a connection with, the native animals of NavajoLands. The Zoo is set among the natural sandstone terrain of Window Rock, and provides a quiet atmosphere for our 50,000 annual visitors to relax and enjoy. The Navajo Nation is the largest Native American reservation in the U.S., covering 27,000 sq.mi. in parts of Arizona, Utah and New Mexico. Across this vast landscape you will find stunning redrock cliffs, canyons,and buttes, high mountain forests, and low ‘badland’ deserts. This diverse landscape makes for a great diversity in plants and animals as well. When visiting NavajoLands, stop by and visit the Zoo. We are open to visitors from 10:00 am to 5:00 pm, Monday through Saturday….and most major holidays. Monday - Saturday | 10 a.m. - 5:00 p.m. Admission is ALWAYS FREE....for EVERYONE ! !